Der EverQuest 2 Server Valor wird Mittwoch, den 21.05.2014 um 9:00 Uhr für eine Serveraktualisierung heruntergefahren. Folgende Update Infos wurden im EverQuest 2 Forum veröffentlicht. A new currency exchange merchant, Barnaby Blunderbuss, has been added to the docks ofButcherblockMountainswhere you can exchange most currencies for transmuting and tinkering training components. Some of the eligible currencies include Maj’Dul insignia tokens, Void Shards, D.I.R.T.Y. Money and many more! All AA EXP event messages now include the amount of EXP granted. Resolved an issue where the amount of EXP displayed when converting adventure EXP to AA EXP did not reflect any server or personal bonus multipliers. The spell „Melting Soles“ should now show up in detrimental window. Lady Mirenilla’s Keepers can no longer be stunned. Lady Mirenilla’s Keepers buffs should no longer state they can be charmed. Lady Mirenilla will more fiercely protect her summoned beast as long as it does her bidding. Lady Mirenilla’s beast should no longer remain dazed longer than intended. Lord Feshlak’s dancing flames should no longer be targetable. Lord Feshlak’s dancing flames should not despawn if they grow too large. Lord Kreizenn’s scent of blood ability should be correctly checking for dead players. When their owner is not in combat, Mercenaries will regenerate health at an increased rate. The recipe list has been playing memory training games and will now properly remember and display the position of the recipe you just crafted after item creation. The Shady Swashbuckler now has six second versions of the Bloody Shank weapons available for sale. 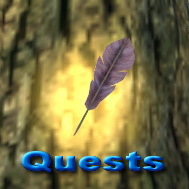 Statistic bonuses on Bloody Shank have been improved to match the difficulty of completing the quest. Inconspicuous Strike III and IV have had their damage values corrected.